The Congressional Leadership Fund, a super-PAC serving the needs of the Republican leadership in the US House, has decided to cut off support for incumbent Rep. Mike Coffman in Colorado's 6th Congressional District. The super-PAC has decided to pull back $1 million in TV advertising it was planning to spend to help Coffman keep his seat. 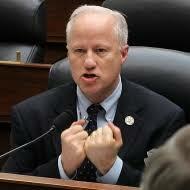 So who's the Democrat giving Coffman such a run? Jason Crow was an active duty Army officer on 9/11, with the 82nd Airborne Division, and he subsequently led a division of paratroopers in the invasion of Iraq. "Shortly after returning from Iraq he joined the U.S. Army’s elite 75th Ranger Regiment, serving two additional tours – this time in Afghanistan, as part of the Joint Special Operations Task Force, where Jason served along the Pakistan border and achieved the rank of Captain." After his service, Crow was very active as a veterans advocate, and he is now a practicing attorney.